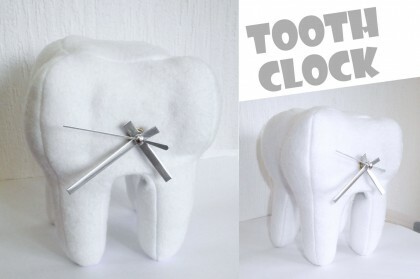 I absolutely adore this tooth clock! My friend is getting her wisdom teeth out soon and she wants me to make her a tooth plush. I’m definitely worried about this one because I cannot find any designs that actually look like an actual tooth! Yours however, looks exactly like what I’m looking for. Is it at all possible that I could get the template for your tooth? I completely understand if you would not like to share the template because it is a very unique design! Thank you so much for taking the time to read my comment! Did you decide to not post a pattern for this?